Amanda Hocking is a lifelong Minnesotan obsessed with Batman and Jim Henson. In between watching cooking shows, taking care of her small menagerie of pets, and drinking too much Red Bull Zero, she writes young adult urban fantasy and paranormal romance. She has published over fifteen novels, including the New York Times Bestselling series the Trylle Trilogy and the Kanin Chronicles, along with the Watersong, My Blood Approves, and the Hollows series. This one starts off with a bang but slightly fizzes in and out during the rest of the story. Once things get moving it still has its slow parts but the story and characters were great and I still loved it! I haven't had that much luck with this authors books but this one I really did like. I loved all the abilities that each person had in the traveling show. And you really fall in love with each and everyone of them. Although this is a stand alone I think that more books could be added to this world. As the show goes on its travels. This one slightly reminded me of the Miss Peregrine series. I do wish it would have been set in our time period as most kids were not born in the 80's-90's and won't get most of the references. The mystery and creepiness was great and I really loved that aspect of the story. Mara was such a great character, strong, no nonsense, she knew where she was going for the most part. This book was one great ride that I hope continuities into a full series. The Freekshow meets the Paranormal! 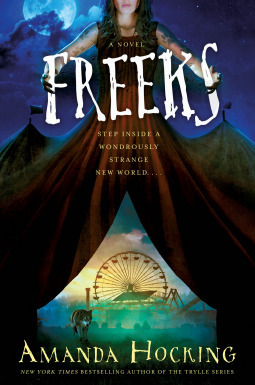 The prize is one finished hardcover copy of FREEKS, U.S. entries only.